As I sit here writing this, 2 months after Troy died, I realise how much I still miss the big guy. It devastates me every time we lose a dog. It never gets any easier and all of you reading this who have lost a dog, will know how it feels. Our remedy for this is a glass of wine and memories, of which we have many. Troy came into our lives in July 2010 and we were blessed with his company each and every day. I never compare dogs. They all have their own personalities and each and every one of them have left a distinctive paw print on our hearts. Whilst we have always had rescue dogs, Troy was our first from Second Chances. From the day he came into our lives he bonded with our family and friends. He was loved by all who met him and many of those that met him virtually on social media from the photos I posted. Troy attracted a lot of attention when we were out and about and he was photographed by many of the people we me on our travels and he loved the attention. As we travelled all over the UK he was welcomed in many eating and drinking establishments. Troy was a credit to our family and a great ambassador for our charity and the breed. No matter how far we walked, he was always up for more, regardless of the weather, night or day, he was ready to go out. His Frisbee was his favourite toy and he carried with him on our walks. We walked together almost every day and averaging about 10 miles – that’s a crazy 25.5 thousand miles over his life. Including 76 miles non-stop when we walked the West Highland Way together to raise funds for Second Chances charity in October 2016. When he attended the charity’s fundraising events, people wanted to meet him. He also helped me with the numerous dogs that we fostered over the years. Some over night and some for weeks at a time. 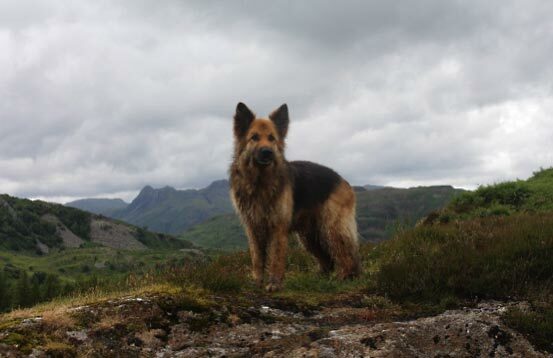 I rushed him to the vets fearing the worst, as we had lost two of our previous German Shepherd males in similar circumstances. Everyone at Vetrica in Rosyth were brilliant, calm and business like. But we all knew that the odds were stacked against him seeing the end of this day. I left him at the vets and cried all the way home. As we suspected Troy had a tumour that had ruptured, severely damaging his spleen. But as the vet said, if you are going to have a tumour, the spleen is the best place to have it as you can live without it. Troy miraculously came through the operation and we were able to take Troy home. The biopsy results confirmed our worst fears. Troy had a particularly aggressive cancer, Hemangiosaracoma. The prognosis was 3 to 6 months. We decided not to change a thing in Troy’s routine and we were lucky to have his company for a further 4 months. Long walks and fresh air. If you had met us on our travels, the only sign that Troy had any issues was his boot to protect his paw, which he occasionally dragged. Troy passed away on Sunday 4 September 2017, a couple of months before his 9th birthday. He died in a field doing what he loved. He collapsed whilst we were on our walk and I sat with him, his head on my lap for 10 minutes, as he slipped away.